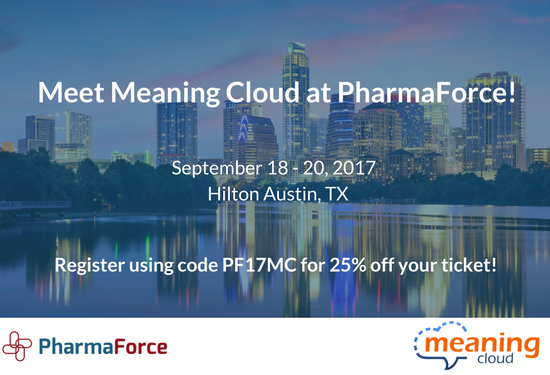 At MeaningCloud, we are proud to sponsor the PharmaForce 2017 Conference. PharmaForce is an interactive conference for marketing and sales leaders from pharmaceutical companies to be held on September 18-20, 2017, in Austin, TX. PharmaForce is the event for Pharma commercial innovators. Now in its 11th year, PharmaForce is the only life sciences event that addresses both marketing and sales strategies to achieve commercial success. Market Intelligence, extracting meaningful insights from any content. Voice of the Patient Analytics. Automatic profiling of patients and professionals. We count among our clients some the largest companies in the Pharmaceutical industry. Join us in Austin, Texas, and visit our booth. If you are interested in attending the PharmaForce Conference next September 18-20, just drop us a line to info@meaningcloud.com. We have an important discount for you! Looking forward to seeing you at the PharmaForce Conference!